Here's Kelly with her beautiful new creation - and you know what? No excuses here - you will totally feel the urge to grab some paints and a canvas! ;) Kelly's painting is so easy to create and she's also sharing a lot of friendly and helpful hints. Enjoy! Here we are at the end of the year, I hope you have all had a happy and healthy holiday season. For this month's project I wanted to create something that was simple, fun and full of bright colors. Something cheerful and warming to the soul. 2. I prepped the board with Soft Gloss Gel to seal in the wood. It ensures the sap won’t seep through later. I then applied different shades of the Impasto paints in random marks on the board. 3. I used the brushes but for highlights, I also applied some of the yellow Pure Sunshine Metallique and gold Dragon's Eye Sparks paint here and there with my fingers. Have fun and get messy! 4. 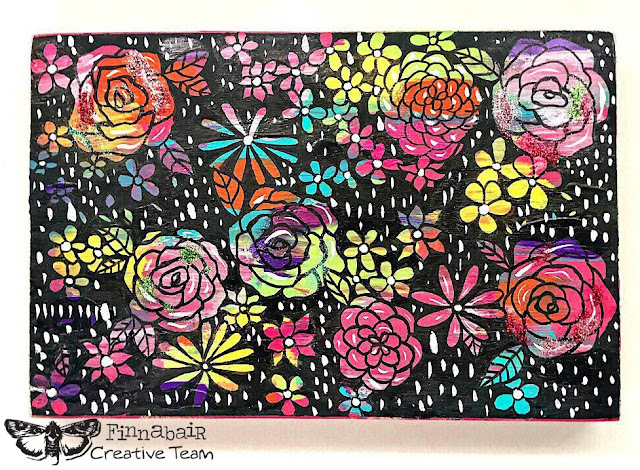 Next I mixed the black Impasto paint with a bit of water to make it more fluid and painted with a liner brush the outlines of flowers all over the canvas board. There is no wrong way to do this, whatever flowers you like! Just make sure there is a lot of them close together & even touching. 5. When the out lines are dry, add a little more of the black impasto paint to your pallete. I used a small flat square brush to fill in all the spaces between the flowers with black paint. It is tedious, but it’s so fun to see the flower color really emerge as you push black into the background. It makes the flowers pop off the canvas! Artist tip - take your time with outlines and filling background in, it takes time and a slow, steady hand. The reward of all the work is a intricate and unique flower art piece! 6. The final step is use the white Impasto paint to make marks on the black paint and more highlights on the flowers. This is where you piece comes to life! You can make any marks you want! You can also add words or stamps if you’d like. I also used 3D Gloss Gel on the flowers when they dried and different colors of Glitter here and there to add sparkle. You can paint this kind of image over and over and it will look different every time. I think this would also make darling hand made cards on paper too. I hope you all enjoyed this fun little floral project! Sometimes it’s hard to make time to create art, but with this kind of project, you can work on a little at a time! Working in lots of juicy layers of paint is one of my favorite parts of painting. Have the best last week of 2017 and a super creative New Year! LOVE this technique! It must be so much FUN to see what you end up with!